An enticing new extrasolar planet found using the Keck Observatory in Hawaii is just three times the mass of Earth and it orbits the parent star squarely in the middle of the star’s “Goldilocks zone,” a potential habitable region where liquid water could exist on the planet‘s surface. If confirmed, this would be the most Earth-like exoplanet yet discovered and the first strong case for a potentially habitable one. The discoverers also say this finding could mean our galaxy may be teeming with prospective habitable planets. Read the article in Universe Today, and let your mind sing. When is an object not an object? When it's an instrument. I had some major work done on my fiddle. It now has a new bridge and soundpost, its first "update" in the 17 years I have owned it. It also has new strings, and a freshly-rehaired bow. During its rehabilitation I spent time practicing my daughter's lovely and very-easy-to-play violin, and established a relationship with it: I set its parts into motion, and it sent me back all kinds of sounds that made me very happy. They were not sounds in my usual violin "voice," but they were sounds in my daughter's violin "voice," so the pleasure was rather personal. It was really the first time I had intimate contact with a violin other than my own. My fiddle sounded horrible when it came back from its "makeover." I couldn't find any familiar sound anywhere, particularly in the upper positions. It kind of felt like an object to me: perhaps a violin-shaped box that used to hold my former instrument. I knew that everything was "right," but it didn't sound right or feel right. My reaction was to do the only thing I could do: subject it to a week of Dounis and Sevcik: shifting up and down the strings, forcing it to play double stops and generate difference tones, until I didn't have to use force anymore. Now I have my violin voice back. Thank goodness. This proves that an instrument is a living thing: something that bends to the will of the person playing it, and something with a definite and unique personality. Michael and I made a jaunt up to Chicago yesterday to hear Van Dyke Parks and Clare and the Reasons play a concert at Schubas, a restaurant and concert venue on the near north side. Michael, who named his blog after "Orange Crate Art," one of Van Dyke Parks' most charming songs, has been a devoted fan for years and years. After having tea with him at the Drake Hotel, I have joined the ranks of his admirers. I was totally charmed by his sharp-as-a-diamond-stylus wit, his style, and his extreme generosity. Unfortunately the tea menu at the Drake has little to offer to vegans besides tea, so while Van Dyke and Michael enjoyed what I think was a lemon curd, some clotted cream, and an array of dainty-but-rich cakes and scones, I had an order of something called "Little Miss Sandwiches" (peanut butter and jelly), which is pictured above. The palm court (mais sans palms) atmosphere of the Drake, which is really quite well-suited to Van Dyke Parks' music, had harp music for their afternoon tea. Penny Currier was our harpist du jour, and when she came over to our table to thank the nice man who gave her a tip (who obviously knew something about the harp), she probably had no idea who he was. We brought Van Dyke back to his hotel, and went to the Schubas, where we had dinner (they make a great vegan burrito). We then made our way into the concert room where I observed a few rituals that were odd to me. I ask my music appreciation students to write about the protocol they notice at their (often first) experience at a classical concert. This was my first time going to a non-classical concert in a venue like this one, and I did notice some odd customs that seemed to be protocol. The concert room at Schubas has benches along one side wall, four or five tables with chairs along the other, and the middle is an open floor. I made a beeline for one of the tables (luckily we were in the front of the line of people waiting to get in), and claimed a seat. I noticed that other people made their beelines for particular places to stand, and there they stood. People didn't talk, really. They just stood. Eventually the place filled up modestly, and the show began about 20 minutes later than announced, after the musicians quietly made their way, in dribs and drabs, onto the stage. There was no audience applause. Olivier Manchon, a sparklingly-talented violinist (among other things) greeted the audience with an imitation of Ira Glass from "This American Life," and the show began. All the members of the ensemble have beautiful voices, and most of them double on various instruments. A brass trio (French horn, trombone, and bass trombone) from Chicago joined the core group of violin, cello, and bass with various doubles on clarinet, keyboard, washboard, glockenspiel, electric bass, percussion, and plastic soprano recorder. The most audacious double of the evening was when Manchon, while playing the guitar, took breaks (without missing beats) to play left-handed recorder and right-handed glockenspiel simultaneously. I was quite impressed when Manchon would sing (back up) while playing the violin, which is something I find almost impossible to do because of the vibrations that occur between my neck and the instrument. 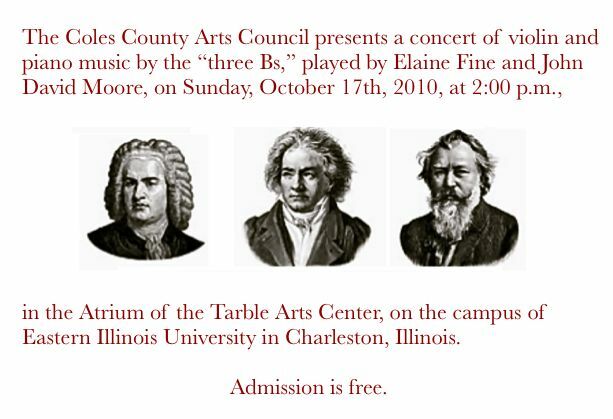 The arrangements were excellent, and the ensemble playing was disciplined and precise, but not mechanical. The sound was successfully amplified so that the two string players, who simply used standing stage microphones on their acoustic instruments, were nicely balanced to the brass, who did not use amplification. The result was more of an "enhanced" acoustic sound than an electronically-created one. The group did incorporate sampled electronic sounds very tastefully into their arrangements, which impressed me quite a bit. More people arrived during the course of the show, and by the time Van Dyke Parks came on stage to play with the group, the hall was full of tall people standing. If I had been standing (I really don't like to listen to music standing up if I can sit down), I wouldn't have been able to see anyway. I was able to catch a glimpse here and there. After a short intermission Van Dyke Parks, Manchon, the cellist of the ensemble whom they called "tiny," and the bass player played a set of songs and chamber music. Van Dyke, who at tea was irrepressibly witty and lovable, was irrepressibly witty and lovable on stage, but even more so because he had a microphone and a keyboard. He began the set with the "lion's roar" from Saint-Saens' "Carnival of the Animals," and then launched into a Br'er Rabbit-based bit of story and song, which then moved into other mixtures of his Southern-influenced (but not too much) idealistic Americana. He made very serious cultural comments that he dressed up in a kind of semi-mockery, which made some members of the audience laugh. Some members of the audience got a little nervous when Van Dyke played some very heartfelt Gottschalk in a beautiful arrangement for keyboard and strings, but little by little they understood that they were experiencing music that defies the genres that people have been using to try to make sense of the great kaleidoscope and smorgasbord of music that they have been lucky enough to have at their fingertips since recorded music became so easy to "acquire" and enjoy. It was all simply beautiful music, that was exquisitely played and sung, and was offered in a spirit of true warmth and generosity. Van Dyke Parks' jokes and banter were funny, but I won't repeat them here, just in case someone reading this is planning to go to an upcoming show on this tour. Towards the end of the concert he did comment on the oddity of people standing in the front of the audience. Perhaps for some of the future shows on this tour, if this is indeed custom to have this kind of standing arrangement, someone might accommodate the audience with some chairs in the front, so that the people who want to stand can see above the people who are seated. Be sure to read Michael Leddy's post about the concert. Actually in the case of violin playing, Je sais quoi. After a lot of careful (and not so careful) thought, I have figured out what it is that sets Antal Szalai apart from the other violinists in the 2010 International Violin Competition of Indianapolis. It is his deep understanding of the Auer tradition--the tradition that Leopold Auer inherited from Joseph Joachim. Perhaps it is his participation in that tradition that makes Szalai sound like a violinist from a different time. He is, as far as I'm concerned, a consummate professional. The rest of the violinists (many who are quite a bit younger than him), sound like they are gifted and capable students, who have nerves of steel, and know their way around the violin. You can hear the difference in just a few notes. The "old-world" European tradition (particularly the Jewish European tradition) seems almost scarce in the modern world of high-profile violinists. I imagine it is partly due to the proportionately large number of non-European violinists who are no longer emotionally connected with the fiddle playing tradition (the tradition that inspired much of the violin's best repertoire) that has its roots in Odessa and St. Petersburg. It is possible to learn the art of musical inflection and to find something genuinely beautiful to project in Bloch's Nigun or Auer's Hebrew Melody, but direct experience with the world those pieces come from is something that can't really be taught. You don't have to be Jewish (for example) to play these pieces in a totally satisfying way, but you have to have internalized the pathos of the tradition in order to project it. If you do not, all an audience could hope to experience would be impressively clean and in-tune playing, impeccable rhythm, a beautiful sound with a lovely vibrato, a bit of showmanship, and a surface sheen. These are admirable qualities (some of which I hope to attain some day), but they are not enough for me as a listener. Those elements alone, without the pathos, generally do not satisfy my needs. Szalai is, in my mind, a worthy successor to Augustin Hadelich. What a thrill it would to hear the two of them play together some day. Prokofiev anyone? How about a recording of some Bartok Duets? Let's hope that all the judges (who do not confer with one another at all during this competition) are all of sound mind. UPDATE: Je ne sais porquoi: here's the order of the laureates. I do think that Kang is an excellent violinist. My statement above still stands, and keeps my violinistic tastes firmly planted in the "old school." I heard a knock-your-Hungarian-socks-off performance of the Bartok Violin Concerto from the Finals of International Violin Competition of Indianapolis this evening that was streamed live from the performance. Part of the joy of listening to this was to observe the way the orchestra responded to Szalai's "mother tongue" sense of color in the piece. Figurative lightbulbs were turning on above the heads of the musicians in the orchestra, and I imagined thought balloons that read, "Oh, so this is what the piece is about." The recording of it is archived here. Unfortunately mac computers require a special plug-in to listen successfully to the archived performances (which I couldn't find through the link). The fiddle player was Antal Szalai, who happens to be the son of the great gypsy fiddler Antal Szalai. Nuts and Cracked: How Far From Ballet Can You Get? Clara is changed to Mary, the Nutcracker has essentially become Pinnochio, and, because the story is set in Vienna, there seems to be an appearance (according to the cast list) by Freud's twin nieces. Freud did actually have two nieces: Lucie Freud 1926-1933, and Margarethe Freud 1915-1931, but they weren't twins by any stretch of the imagination. There is also an appearance by a character named "Goebbels," who may or may not be based on Joseph Goebbels of Nazi propaganda fame. I don't see any dancing or sugar plum fairies, but there are a lot of stunt people, and visual-effects people. What a hoot it was to find that the folks over at Wikio have listed Musical Assumptions as one of their top 20 classical music blogs! I'm glad that people enjoy coming here, looking around, and spending enough time for the algorithm-fairies to make it register. Who could ask for anything more? Michael mentioned the ever-popular Sextet from Lucia that was being streamed over the telephone in 1910. As a longtime professional musician, I’ve always felt that there might be ways to help the general public understand the kind of life we really lead. Since everybody knows how to type these days, why not have people use that skill to understand a musician’s life? First, get an old manual (non-electric) typewriter. On an old Underwood or Remington, the pressure of the fingers shows up on the paper. Next, find something really old to type, perhaps a random page or two of the Bible, or the first page of Milton’s Paradise Lost. Start typing—make sure you don’t make any mistakes. Then, you’ll have to type in a rhythm, let’s say: “Shave and a hair cut, two bits.” Keep it up, without making any mistakes. Have a friend (or enemy) indicate how fast to do this. Now, all nouns should be made heavier than usual, and all adjectives should be lighter than usual. And make sure everything else is in between, and even. How’s that working out for ya? Do your fingers hurt, is your brain perhaps a little taxed, is your “friend” a little too relentless about the speed? Don’t worry, after an hour and 15 minutes of this, you get a break! I couldn't resist the pun. Here's a bit more musical Jewish wisdom from Seymour Barab! You can find your way to more of this feast (there are 14 parts in all) here. This is the first installment in a celebration of Seymour's 90th birthday this coming January. Singers and actors from all over the world will be contributing their performances to this archive during the coming months. If you might be interested in trying your hand (and other parts of your vocal and acting anatomy) at any of these jokes, send me an e-mail, and I'll send you a PDF of the score. I can't think of a better way to kick off the New Year than to offer a link to this (freshly-uploaded) performance of the first three numbers in Seymour Barab's one-act opera Jewish Humor from Oy to Vey. Here is Part 2: "Futility," "Questionnaire," and "In the Cards." Stay tuned for more! There are 18 jokes in all. The quartet, known only as "The Gypsies," plays almost constantly throughout the movie. The movie is a bit creepy. It is actually very creepy, considering the nearly 30-year age difference between Gary Cooper and Audrey Hepburn (and the characters they play), but the music is spectacular. 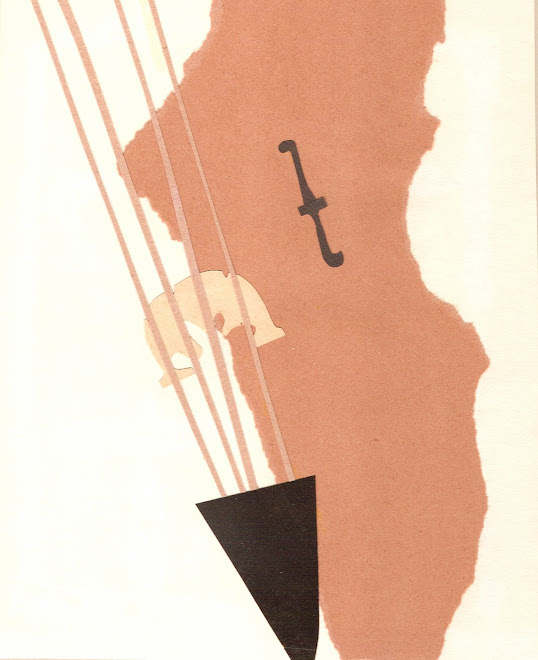 And Hepburn plays a cellist (and, to a certain extent, the cello). I really love practicing the music that John David and I playing for our October 17th concert. While practicing the Brahms this morning, I observed (once again) that Brahms notated his music rather impractically for the violin, but at the same time he had an impeccable sense of tessitura. He knows exactly how what he writes will sound in the various registers of the instrument, and on the instrument's different strings. His phrase directions and phrase lengths are natural and obvious, if you just pay attention to the musical syntax. If I find that breaking a long slur, so that there are two or four notes to a bow (rather than 20 or more), some passages end up sounding smoother. Another fiddle player (with a better bow arm then me), might take up the challenge of keeping everything the way it is on the printed page, either for technical reasons, or to dutifully do what "the composer says to do." Since Brahms wasn't a violinist, I believe that his articulations are best approached with the intention of keeping the integrity of the direction and contour of the phrase, and not regarded as a series of orange cones to navigate around. I believe that Brahms wanted his music to be played by flesh and blood people who had individual (and strong) personalities, and perhaps individual approaches to technique. His violin writing was informed by Joachim's technique,and we can see how oddly he held his bow. The only way I would compare my experience to Brahms' experience as a composer (he is, as far as I'm concerned, the incomparable one) is that I like my music to be played by people with personalities that are different from mine. I certainly like my music to be played by people who have far better technique than I do. Perhaps, in that way, a composer is like a clothing designer, or a hat maker; people who usually design their works to be worn by a variety of people. Clothes look different on different people. They are also worn for different reasons, and in different weather. A well-designed piece of clothing will be durable, practical, versatile, and beautiful. People think that a Sheikh should show miracles and manifest illumination. The requirement in a teacher, however, is only that he should possess all that the disciple needs. Towards the end of this video of Ben Zander, there is a wonderful case of a student finding the right teacher at the right time. 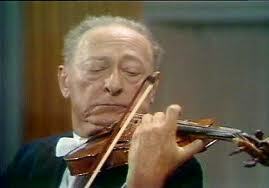 Perhaps Zander is, in many respects, the "Anti-Heifetz." I have been reading Marjorie Kransberg-Talvi's three-part series of posts about auditioning to be in Jascha Heifetz's master class (Chapter 9 of Frantic: The Memoir). The concert season has started, and though is a bit early to be thinking about Thanksgiving dinner, ideas keep popping up. Jason Heath pointed me to this bit of food for thought. Amoris International has made a beautiful PDF edition (to download for free) of my setting for oboe and bassoon (and now oboe d'amore and bass oboe) of the Lewandowski Kol Nidre that is often used for the first service of Yom Kippur (as an alternative to the Bruch). You can access a PDF file that has other duet configurations (for any combination of C and/or B-flat instruments) as well as PDF files for solo string versions (viola, violin, and cello) through my thematic catalog post. 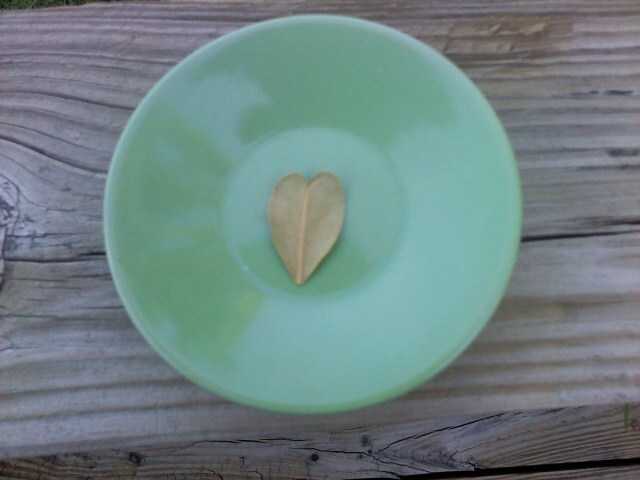 This heart-shaped bay leaf made some tasty split pea soup!
. . . and a big "thank you" to Miles Hoffman for writing this excellent op-ed piece in today's New York Times. Last night I had my first hour-long drive in the dark of the concert season (it was after a pops concert in a park). The night was clear, the traffic was (as usual) minimal, and the radio signal was strong. Coming to my car on that strong radio signal was an interview with Karen Maezen Miller, who was discussing her new book Hand Wash Cold: Care Instructions for an Ordinary Life. I was fascinated by the discussion. Miller suggests that happiness can be found at the bottom of a laundry basket, and that happiness is something fleeting that results from completing a task, particularly one that you might approach reluctantly. I have always liked the idea of Zen, and have always considered my practicing a sort of Zen-like meditation, but I know that people who practice Zen for Zen's sake would certainly not consider my meditative musical experiences with Sevcik and Dounis as something having anything to do with the practice of Zen. It's OK. I don't think of the practice of sitting in lotus position (for people with short legs it is extremely uncomfortable, you know) and contemplating the moment is anything particularly artistic or earth-shattering, but I suppose there are all sorts of paths to achieving a sense of personal dignity. I guess I'll go and fold some laundry, and practice a few scales. UPDATE: I got very little happiness from folding laundry, and even less from putting it away, but I enjoyed practicing a great deal.